Updates to Larry D.'s profile since your last visit are highlighted in yellow. 5 grown up children in a "blended" family, David, Dan, Michael, Linnea, Lincoln. 13 grandchildren. Drafted in 1970, the minute I graduated from the University, and served as a medic, weaponless, conscientious objector, in the U.S, Army. Upon return, ran outdoor education programs, started patient TV channel at Children's Hospital, and worked till 2006 as a specialist in the Mpls schools, teaching storytelling and video. Currently work part-time for Plymouth Church in Mpls, running program for adults with mental illness. Storytelling programs with Key of See Storytellers, and active with Veterans for Peace. Did 61 Mile Hike on 61st birthday, and 70 Mile BEATING WEAPONS INTO WINDMILLS WALK when I turned 70. SIXTY-ONE published in 2016 by Shipwreckt Books. 61 stories calling for less war, therefore fewer veterans, and an end to arguing about veteran care, especially mental health and exposure to chemical toxins. Larry D. Johnson added a photo to his profile gallery. Larry D. Johnson changed his profile picture. 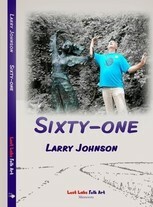 Larry D. Johnson updated his profile. View.